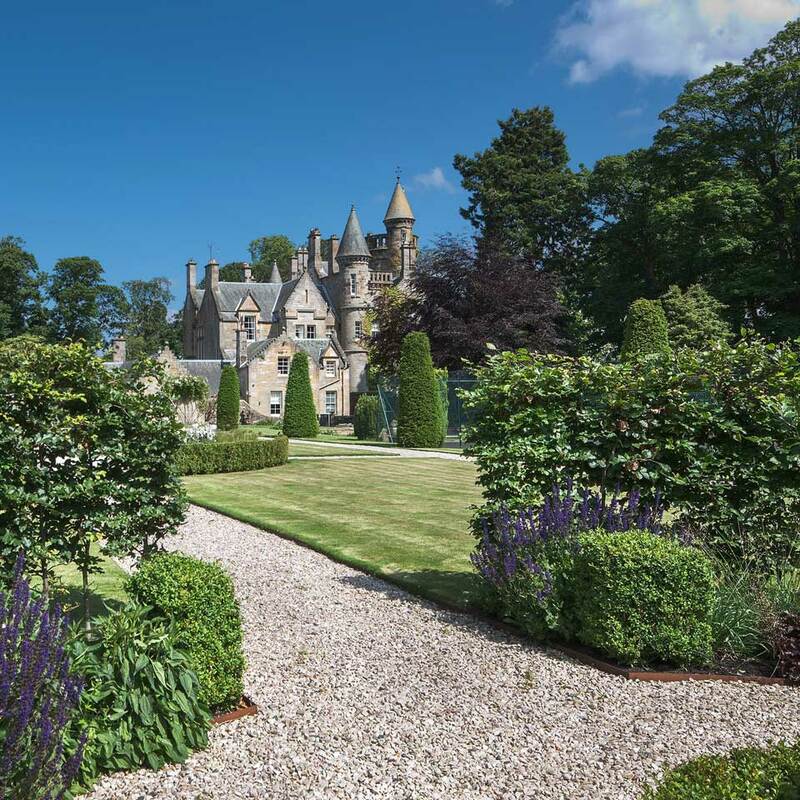 Edinburgh-based wine merchant and Provost of Leith Thomas Hutchison commissioned David Rhind, a celebrated Scottish architect, to design Carlowrie Castle. Best known for grand commercial and public buildings, Carlowrie Castle is one of Rhind’s few domestic commissions. Thomas Hutchison and his descendents lived at Carlowrie Castle for the next 130 years. Sadly Thomas was never able to see his castle finished: he died in 1852, the same year that construction began. The castle was completed by his son Robert and bears the Hutchison coat of arms, carved into the stone above the front door. 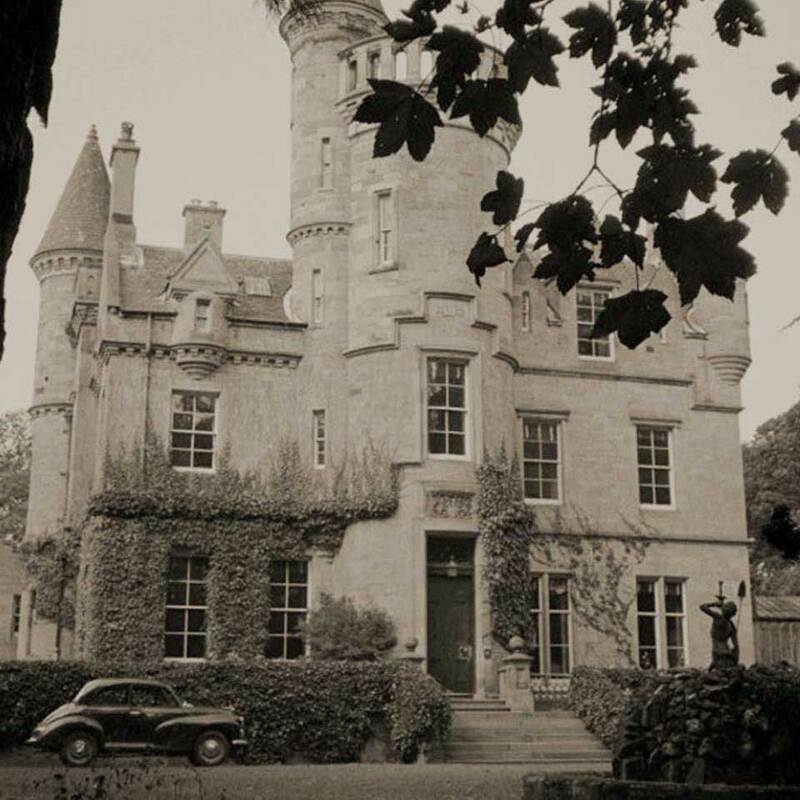 In 1873 Robert invited David Rhind back to design the gatehouses and outbuildings of the castle. Like Thomas Hutchison, many of his children and grandchildren were active in the wine trading business and in prominent civic roles. However, it is Thomas’s granddaughter Isobel Wylie Hutchison who is the most intriguing member of the family. Born at Carlowrie in 1889, Isobel had an idyllic childhood until she lost both her brothers and her father in quick succession. Restless and grieving, Isobel found comfort outdoors and while walking, which laid the groundwork for her inspiring independent and unconventional life. Isobel was a successful Arctic explorer and botanist. Defying convention, she travelled alone on expeditions that few would attempt, even today. She risked life and limb collecting plants for the Royal Botanic Gardens and Kew, pioneering new routes across inhospitable terrain, boarding ghost ships and capturing some of the earliest documentary footage ever recorded. 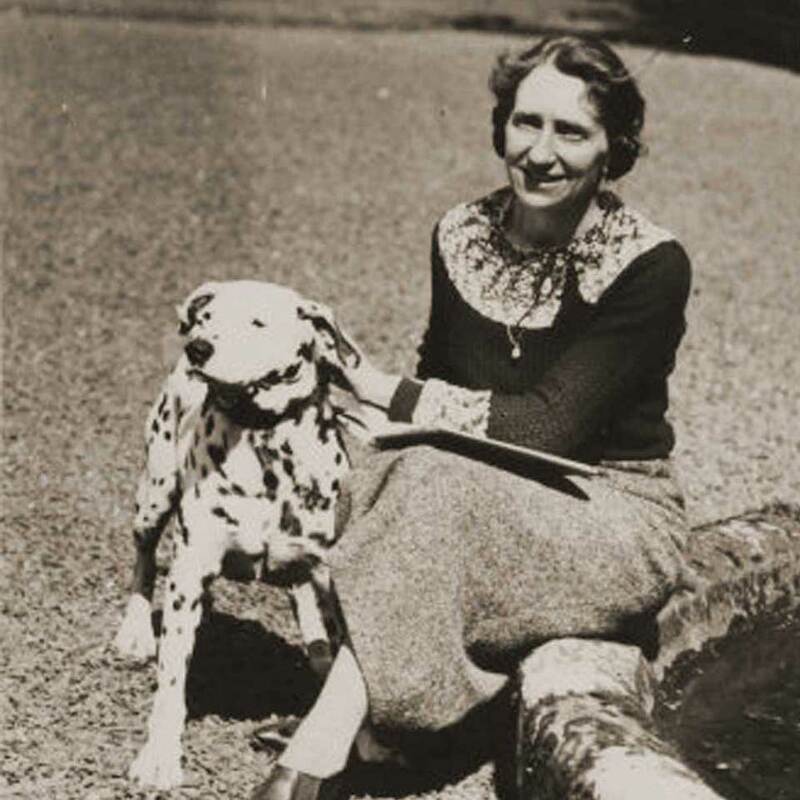 Isobel spoke over eight languages fluently, and she was an accomplished artist, poet and travel writer, regularly submitting to newspapers and journals including the National Geographic. After World War 2, Isobel’s writing helped finance repairs to the castle which had been badly damaged acting as a wartime RAF base. Isobel’s exceptional contributions to geography, exploration and botany earned her a number of coveted awards. Most prestigious was the Mungo Park Medal, presented to Isobel by the future King George VI on 24th October 1934. Isobel’s legacy can be seen across the Carlowrie Estate. She planted many plants in the grounds, including rare species that she brought back from her travels. Between expeditions and in later life Isobel worked tirelessly in the Victorian glasshouses and carefully preserved the layout of the formal gardens which still exist today. With Isobel’s death in 1982 the Hutchison line ended and Carlowrie castle came on the market for the first time. Discover the Isobel Wylie Hutchison Collection at Carlowrie Castle. The Marshalls acquired the castle in 1982. For the next quarter century Carlowrie was a family home once again, bursting with children and laughter. As the children flew the nest, the parents increasingly wondered about selling. Andrew, their son, recognised Carlowrie’s potential as an events venue and offered the castle a new lease of life. Andrew had nurtured a passion for business ever since his childhood, watching as his father and grandfather built up their own group of businesses which at it’s peak was Scotland’s largest private employer. Aged 18, Andrew left Carlowrie to attend university and then to test his own business acumen. In 2000, Andrew established one of London’s first bespoke lifestyle concierge services, financed through his earnings from a post-university 9 month stint in telesales in London. Through his concierge business, Andrew learnt to anticipate the needs of the super-wealthy, with clients ranging from royals to celebrities. He later added a construction and property development arm to his company and was approached by Stelios Haji-Ioannou, CEO of EasyJet, to design and build the first ever EasyHotel in Earl’s Court. This innovative and forward-thinking project was Andrew’s first introduction to hotels and hospitality. In 2012, Andrew bought Carlowrie from his parents. Bringing his experiences in property development and luxury lifestyle conciergerie to the castle, Andrew transformed it into the spectacular events venue it is today. Andrew instigated a £4 million 2 year refurbishment which, less than a year after opening in 2015, resulted in Carlowrie being recognised as one of the top 3 venues in Europe with under 200 bedrooms. 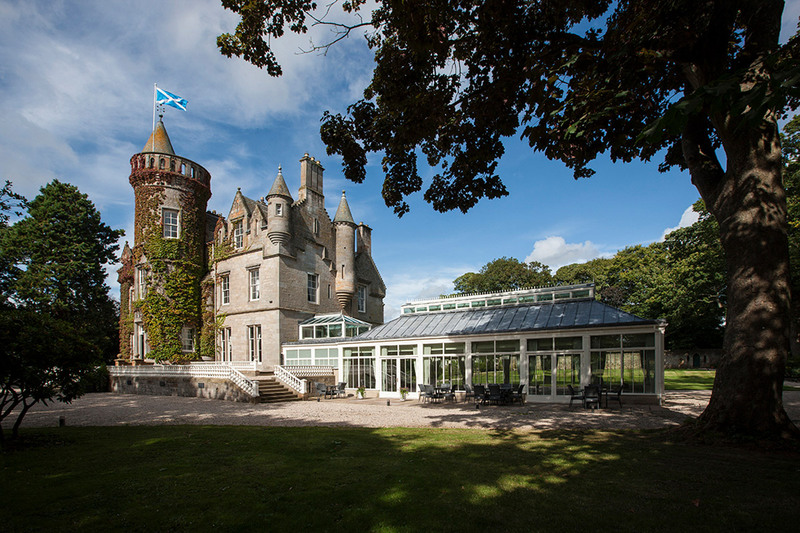 Today, Carlowrie Castle looks to building for the future as well as preserving the past, emphasising philanthropy alongside bespoke events and exceptional customer service. Carlowrie provides regular funding to RESTART, a charity founded by Andrew in 2009 that is transforming vulnerable people’s lives through emergency aid, employment, housing and education. The castle is also a keen advocate and patron of emerging artistic talent. Ask Jen Cusick our Events Manager about the experiences we are able to arrange for you, and your guests.